On Wednesday evenings during the school year, you have an invitation for dinner and fellowship in Friendship Hall. Dinner is served from 6:00 to 6:30 PM and is prepared in our kitchen by our cook and helped by many volunteers. 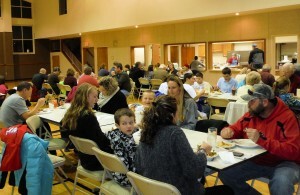 During Lent, dinner is served from 5:45-6:15 PM with the worship service at 7 PM. Reservations are requested by signing up at church on Sunday or by calling the church office by 4 PM Monday.